All of the important processes of metamorphism that we are familiar with can be directly related to geological processes caused by plate tectonics. 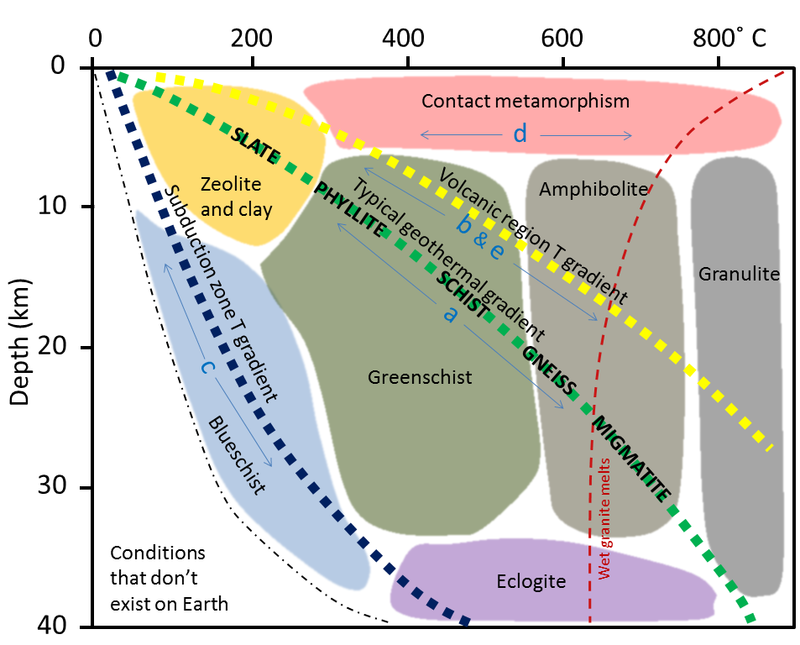 The relationships between plate tectonics and metamorphism are summarized in Figure 7.14, and in more detail in Figures 7.15, 7.16, 7.17, and 7.19. Most regional metamorphism takes place within continental crust. While rocks can be metamorphosed at depth in most areas, the potential for metamorphism is greatest in the roots of mountain ranges where there is a strong likelihood for burial of relatively young sedimentary rock to great depths, as depicted in Figure 7.15. An example would be the Himalayan Range. At this continent-continent convergent boundary, sedimentary rocks have been both thrust up to great heights (nearly 9,000 m above sea level) and also buried to great depths. 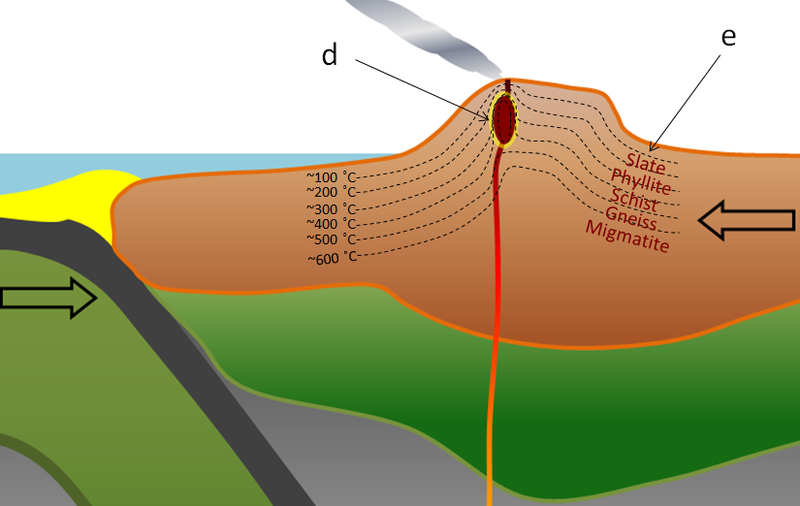 Considering that the normal geothermal gradient (the rate of increase in temperature with depth) is around 30°C per kilometre, rock buried to 9 km below sea level in this situation could be close to 18 km below the surface of the ground, and it is reasonable to expect temperatures up to 500°C. Metamorphic rocks formed there are likely to be foliated because of the strong directional pressure of converging plates. At an oceanic spreading ridge, recently formed oceanic crust of gabbro and basalt is slowly moving away from the plate boundary (Figure 7.16). Water within the crust is forced to rise in the area close to the source of volcanic heat, and this draws more water in from farther out, which eventually creates a convective system where cold seawater is drawn into the crust and then out again onto the sea floor near the ridge. The passage of this water through the oceanic crust at 200° to 300°C promotes metamorphic reactions that change the original pyroxene in the rock to chlorite and serpentine. Because this metamorphism takes place at temperatures well below the temperature at which the rock originally formed (~1200°C), it is known as retrograde metamorphism. The rock that forms in this way is known as greenstone if it isn’t foliated, or greenschist if it is. Chlorite ((Mg5Al)(AlSi3)O10(OH)8) and serpentine ((Mg, Fe)3Si2O5(OH)4) are both “hydrated minerals” meaning that they have water (as OH) in their chemical formulas. When metamorphosed ocean crust is later subducted, the chlorite and serpentine are converted into new non-hydrous minerals (e.g., garnet and pyroxene) and the water that is released migrates into the overlying mantle, where it contributes to flux melting (Chapter 3, section 3.2). At a subduction zone, oceanic crust is forced down into the hot mantle. But because the oceanic crust is now relatively cool, especially along its sea-floor upper surface, it does not heat up quickly, and the subducting rock remains several hundreds of degrees cooler than the surrounding mantle (Figure 7.17). A special type of metamorphism takes place under these very high-pressure but relatively low-temperature conditions, producing an amphibole mineral known as glaucophane (Na2(Mg3Al2)Si8O22(OH)2), which is blue in colour, and is a major component of a rock known as blueschist. If you’ve never seen or even heard of blueschist, it’s not surprising. What is surprising is that anyone has seen it! Most blueschist forms in subduction zones, continues to be subducted, turns into eclogite at about 35 km depth, and then eventually sinks deep into the mantle — never to be seen again. In only a few places in the world, where the subduction process has been interrupted by some tectonic process, has partially subducted blueschist rock returned to the surface. One such place is the area around San Francisco; the rock is known as the Franciscan Complex (Figure 7.18). Magma is produced at convergent boundaries and rises toward the surface, where it can form magma bodies in the upper part of the crust. 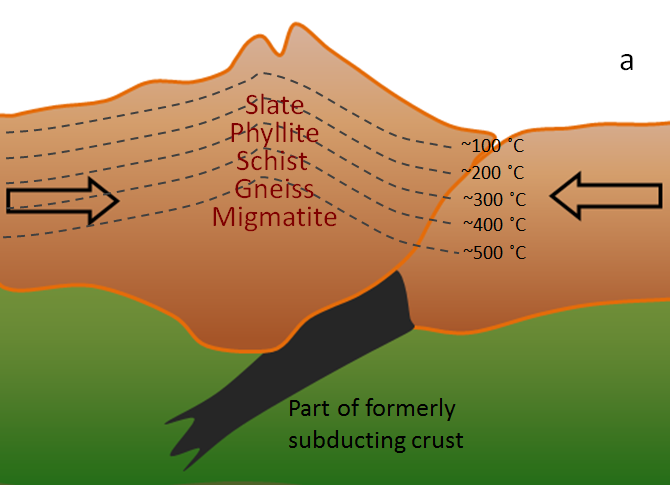 Such magma bodies, at temperatures of around 1000°C, heat up the surrounding rock, leading to contact metamorphism (Figure 7.19). Because this happens at relatively shallow depths, in the absence of directed pressure, the resulting rock does not normally develop foliation. The zone of contact metamorphism around an intrusion is very small (typically metres to tens of metres) compared with the extent of regional metamorphism in other settings (tens of thousands of square kilometres). Regional metamorphism also takes place within volcanic-arc mountain ranges, and because of the extra heat associated with the volcanism, the geothermal gradient is typically a little steeper in these settings (somewhere between 40° and 50°C/km). As a result higher grades of metamorphism can take place closer to surface than is the case in other areas (Figure 7.19). 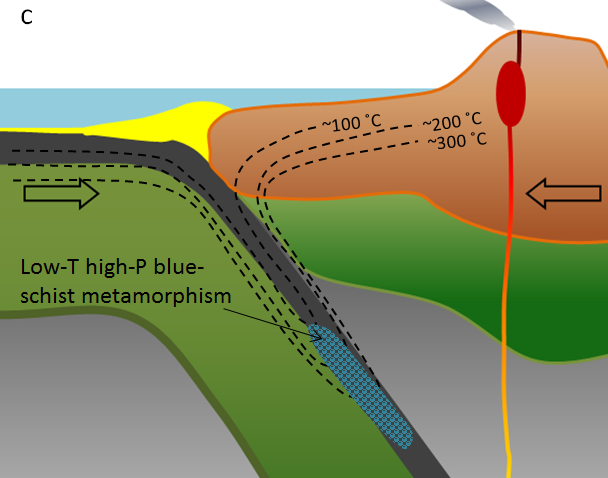 Another way to understand metamorphism is by using a diagram that shows temperature on one axis and depth (which is equivalent to pressure) on the other (Figure 7.20). 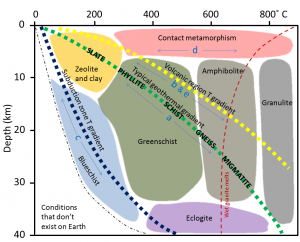 The three heavy dotted lines on this diagram represent Earth’s geothermal gradients under different conditions. In most areas, the rate of increase in temperature with depth is 30°C/km. In other words, if you go 1,000 m down into a mine, the temperature will be roughly 30°C warmer than the average temperature at the surface. In most parts of southern Canada, the average surface temperature is about 10°C, so at 1,000 m depth, it will be about 40°C. That’s uncomfortably hot, so deep mines must have effective ventilation systems. This typical geothermal gradient is shown by the green dotted line in Figure 7.20. At 10 km depth, the temperature is about 300°C and at 20 km it’s about 600°C. In volcanic areas, the geothermal gradient is more like 40° to 50°C/km, so the temperature at 10 km depth is in the 400° to 500°C range. Along subduction zones, as described above, the cold oceanic crust keeps temperatures low, so the gradient is typically less than 10°C/km. The various types of metamorphism described above are represented in Figure 7.20 with the same letters (a through e) used in Figures 7.14 to 7.17 and 7.19. By way of example, if we look at regional metamorphism in areas with typical geothermal gradients, we can see that burial in the 5 km to 10 km range puts us in the zeolite and clay mineral zone (see Figure 7.20), which is equivalent to the formation of slate. At 10 km to 15 km, we are in the greenschist zone (where chlorite would form in mafic volcanic rock) and very fine micas form in mudrock, to produce phyllite. At 15 km to 20 km, larger micas form to produce schist, and at 20 km to 25 km amphibole, feldspar, and quartz form to produce gneiss. Beyond 25 km depth in this setting, we cross the partial melting line for granite (or gneiss) with water present, and so we can expect migmatite to form. 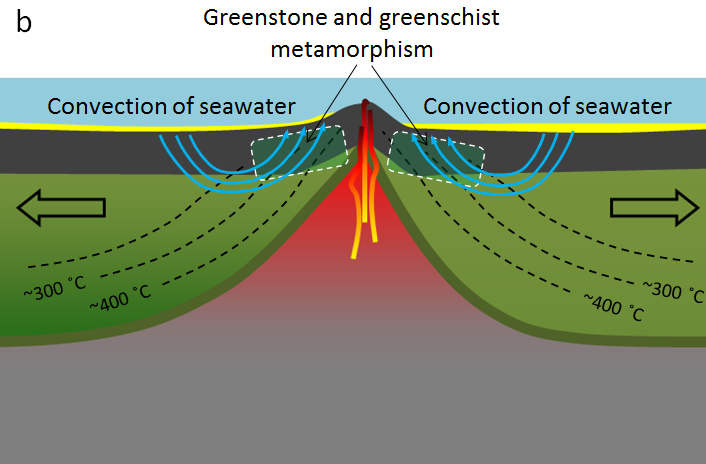 Figure 7.20 shows the types of rock that might form from mudrock at various points along the curve of the “typical” geothermal gradient (dotted green line). Looking at the geothermal gradient for volcanic regions (dotted yellow line in Figure 7.20), estimate the depths at which you would expect to find the same types of rock forming from a mudrock parent. 7.3 Plate Tectonics and Metamorphism by Steven Earle is licensed under a Creative Commons Attribution 4.0 International License, except where otherwise noted.